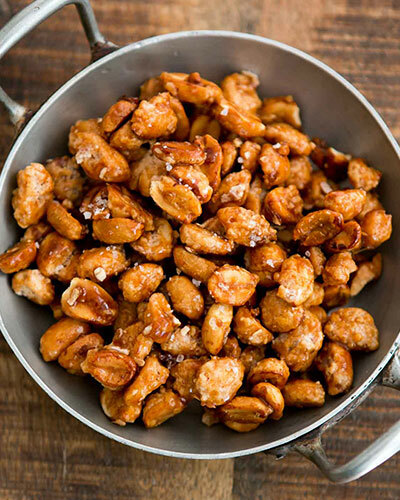 In a wide, heavy-duty skillet, mix the peanuts with sugar and one-third cup of water. Cook the ingredients over moderate heat, stirring frequently, until the liquid seizes up. This will take a few minutes. At this point, the peanuts will get crusty and the sugar will crystallise. The peanuts will become dry and sandy, which is perfectly normal. Lower the heat and keep going, scraping up any syrup that has collected at the bottom of the pan and stir the peanuts in it, coating them as much as possible.Tilt the pan, removing it from the heat from time-to-time to regulate the heat and the syrup, so you can coat the nuts with the liquid as it darkens without burning the peanuts or the syrup – this is the only tricky part. If the mixture starts to smoke, remove it from the heat and stir. Right before the peanuts are done, sprinkle them with a sizable pinch of flaky salt (and pinch of cinnamon or chilli powder, if you want), stir them a couple of times then tilt the peanuts out onto a baking sheet or a marble countertop. Let the peanuts cool completely, then break up any clumps. Store in an airtight container for up to a week.